From developing a first-of-its-kind innovation that is helping aerial surveillance missions operate more efficiently, to creating new policies that will provide pre-migration training for Chinese immigrants, five researchers from across Canada were recognized last night for their efforts in advancing industry innovation, creating new jobs, and transforming the lives of Canadians. Each of the students received an award at the 4th Annual Mitacs Awards Reception, held to honour the amazing contributions of these emerging researchers, who have participated in Mitacs programs aimed at fostering research and innovation - as well as forging stronger bonds between academia and businesses across Canada. Mitacs & NRC-IRAP Award for Commercialization: Rafael Falcon, a PhD graduate from the School of Electrical Engineering and Computer Science at the University of Ottawa, for a research project with Larus Technologies through a Mitacs Accelerate internship. Rafael developed a first-of-its-kind innovation that is helping aerial surveillance missions in Canada operate more efficiently and accurately. Rafael's revolutionary product, the Risk Management Framework, is a major contribution to Larus' Total::Insight™ product used by Canada's Department of National Defence to ensure aerial surveillance aircraft are optimally deployed. Rafael's award was presented by Pam Bjorson, Executive Vice-President of the National Research Council. Mitacs Undergraduate Award for Outstanding Innovation: Pragya Chawla, Miranda House, University of Delhi, hosted in the summer of 2014 by the University of Lethbridge through the Mitacs Globalink program. Under the supervision of Lethbridge professor Dr. Locke Spencer of the Department of Physics and Astronomy, Pragya's research helped to verify the accuracy of data and images from the European Space Agency's Planck telescope mission. Pragya wrote thousands of lines of computer code, developed unique processing algorithms, and analyzed hundreds of GB of data in order to verify the colour-sensitivity of one of the telescope's cameras. The Planck telescope was launched in 2009 with a five-year mission to observe the cosmic microwave background - the oldest most distant light in the universe. Pragya's award was presented by the Honourable Kerry-Lynne Findlay, Minister of National Revenue. Mitacs Master's Award for Outstanding Innovation: Daniela Tuchel, a Master's graduate from the School of Communication and Culture at Royal Roads University, for a research project with the Asia Pacific Foundation of Canada through a Mitacs Accelerate internship. Daniela conducted a series of focus groups and interviews to provide key policy recommendations to improve the process of managing immigration between China and Canada. Daniela's award was also presented by the Honourable Kerry-Lynne Findlay, Minister of National Revenue. Mitacs PhD Award for Outstanding Innovation: Stephen Dugdale, a PhD student from INRS-Centre Eau Terre Environnement, for a research project with Confluence Aquatic Ecosystems through a Mitacs Accelerate internship. Stephen developed an airborne thermal infrared software system to map where Atlantic salmon are taking refuge in waters with high temperatures caused by climate change. The camera, mounted to a helicopter, mapped over 800 km of salmon habitat and cold water patches of the Restigouche River watershed. His research has contributed to the conservation efforts of protecting salmon in temperature-impacted rivers and sustaining sensitive commercial and recreational fish populations. Stephen's award was presented by the Honourable Chris Alexander, Minister for Citizenship and Immigration. Mitacs Postdoctoral Award for Outstanding Innovation: Ricardo Jota, a postdoctoral fellow from the Department of Computer Science at the University of Toronto, for a research project with Tactual Labs through a Mitacs Accelerate internship. Ricardo made a groundbreaking discovery by solving the time lag issue when tapping, swiping, and sliding on touchscreens. His findings have led to the development of new approaches to operating system design that are being applied by industry leaders. The ground-breaking research has resulted in the filing of 10 patent applications. Ricardo's award was presented by the Honourable Bal Gosal, Minister of State for Sport. Two leaders in the business and academic communities were also recognized for their contributions to shaping innovation in Canada. Mitacs Industry Award for Outstanding Leadership: Trojan Technologies, a London, Ontario-based water treatment technology company for their contribution to local university-industry collaborations. Graduate students and postdoctoral fellows have become embedded in Trojan's research and engineering team, leading to the development of new methodologies in water treatment to remove harmful pharmaceuticals from downstream water supplies, and to recapture waste materials for use in alternative energy. 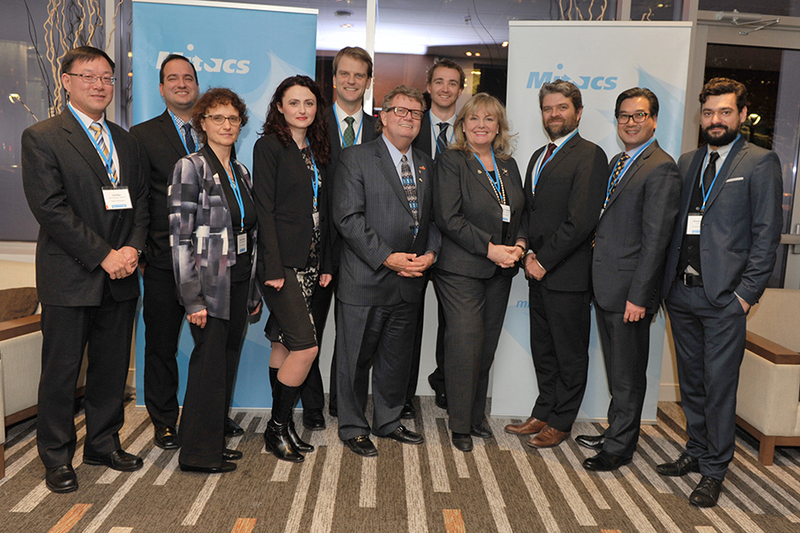 Trojan Technologies' award was presented by the Honourable Ed Holder, Minister of State for Science and Technology. Mitacs Professor Award for Outstanding Leadership: Alan Fung, a professor of Mechanical and Industrial Engineering at Ryerson University for his steadfast leadership of dozens of Mitacs program interns. Professor Fung has fostered many strong relationships with industry and government partners through his research, and has worked to encourage innovative thinking among his students as he mentored them both in and outside of the lab. Professor Fung's award was also presented by the Honourable Ed Holder, Minister of State for Science and Technology. "These researchers are true ambassadors for everything we stand for at Mitacs, including academic leadership, strong problem-solving skills and an aptitude for business. They join thousands of Mitacs researchers across the country that are working to bridge the gap between academia and industry to better the lives of Canadians." Mitacs is a national, private not-for-profit organization that develops the next generation of innovators with vital skills through a suite of unique research and training programs: Mitacs Accelerate, Elevate, Step, and Globalink. In partnership with companies, government and universities, Mitacs is supporting a new economy using Canada's most valuable resource - its people. To view the photo associated with this press release, please visit the following link: http://media3.marketwire.com/docs/0313n.jpg. Ted Mao (Trojan Technologies), Rafael Falcon (University of Ottawa), Linda Gowman (Trojan Technologies), Daniela Tuchel (Royal Roads University), Minister Chris Alexander (Minister of Citizenship and Immigration), Minister Ed Holder (Minister of State, Science and Technology), Stephen Dugdale (Universite INRS), Minister Kerry-Lynne Findlay (Minister of National Revenue), Dr. Rob Annan (interim Chief Executive Officer, Mitacs), Professor Alan Fung (Ryerson University) and Ricardo Jota (University of Toronto).